Flowers make a nice Valentine's Day gift. Roses are even better. 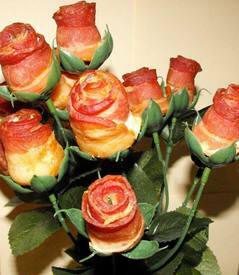 But when you want to give something extraordinary to someone extraordinary...give them BACON ROSES! Valentine's Day pre-orders placed at the link above will be held to ship on or around February 11th for delivery on or before February 14th! We cannot guaranteed delivery ON the 14th, but it will arrive on or before Valentine's Day! !